Odds are, if you’ve followed my work on JGR, you can probably get a pretty rough idea of what genres of games I enjoy; I’m a big fan of sports, I can get down on a quality action RPG, I like wrestling, and I’m real big on simulations. That being said, I’m also a fan of esoteric puzzlers, and the weirder, the better. Dr. Mario? Meh, give me Hatris every day and twice on Sunday. So today, let’s take a closer look at quite possibly my favorite bizarre puzzle game, Wetrix for Nintendo 64, published by Ocean (I see what they did there…). Drying up the lake and drain meter at the cost of the rainbow. The object of Wetrix is fairly simple, actually. You start with a flat square of land, and have to use falling pieces to build up a dam of sorts so that water can’t leak over the sides of the board. If water does manage to run off, it fills a drain meter on the side of the screen, and when the drain fills all the way up, game over. Again, it’s a rather simple premise, but anyone who’s ever played a decent puzzle game can tell you already that there’s going to be more going on, and sure enough, there is. You score points by forming lakes, the bigger the lake, the more points you earn. 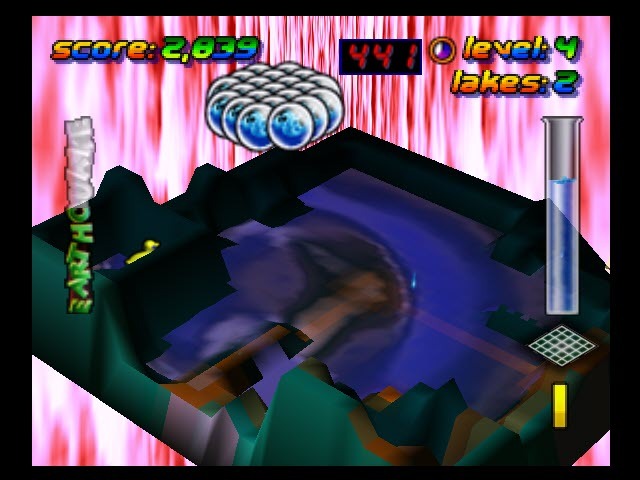 You can also use pieces to divide lakes up, and having multiple lakes gives you a point multiplier for each one. 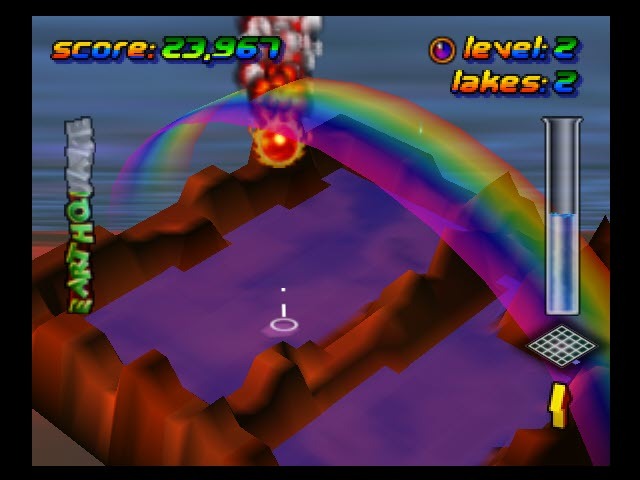 If you build a massive lake, a rainbow forms over it for a point multiplier, and if you form a deep enough lake, a rubber ducky drops into it that can raise your score exponentially. So, what’s stopping you from just building a number of crazy deep lakes and getting ALL the rubber duckies? As it turns out, you’re limited in terms of how much stuff you can pile up on the board. If you stack up too much junk, an earthquake hits and completely rearranges the board, and while that doesn’t necessarily bring your game to an instant end, it will certainly put you behind the eight ball and make it very difficult to dig your way out. To that end, you’re assisted somewhat by the appearance of downer pieces, which lower land slightly, and bombs, which blow huge chunks out of whatever it lands on, however, if you try to get cute and bomb the same spot twice, you’ll trigger an onslaught of bombs that will pretty much bring your game to a grinding halt. Learning to consolidate several lakes into one in Practice Mode. Aside from those, there’re also fireballs that you can use to dry up lakes, which also lowers your drain meter, ice cubes that freeze whatever lake they land on, sea mines that float around and blow holes in the board if they hit the bottom, and a never-ending rain that threatens to push the water level jussst over the top of your impromptu levees. What this all means, in essence, is that you’ll frequently be forced to make some strategic decisions regarding your layout and how you manage the pieces. 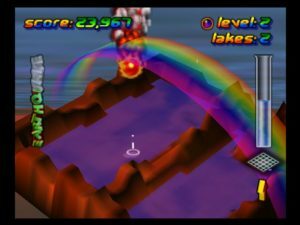 Do you try to just make one monster lake and stay on the rainbow multiplier, risking ice cubes and mines putting a crimp in your plans? Do you try to build a deep lake for the rubber ducky bonus or use that corner for a junk pile you can bomb at your leisure? Assisting you in this water-shoveling expedition is a combination of helpful shadows and a…well…”fluid” physics system. The board is presented at an isometric view, which can make it a bit tricky at times to tell when a wall piece you’re dropping in will connect seamlessly to one you’ve already placed without leaving a gap or creating a peak. Luckily, all the pieces (including downers, bombs, and water) leave a shadow before they land, helping you discern where everything will fit together. Aside from the rain, the water comes down in clusters of water bubbles that break when they hit something. If you have two lakes, for example, one big shallow one and one small but deep one, you can maneuver the water so that it breaks over one of the sides of the deep lake, so some of the water falls into the deep lake and the rest flows down into the shallow one. If you have a gap on one side of the board, you can drop water onto the other side of the board and buy yourself what could be precious seconds as it meanders its way over to the empty spot. Aside from the standard game, there’s a handful of other modes to keep things relatively fresh. 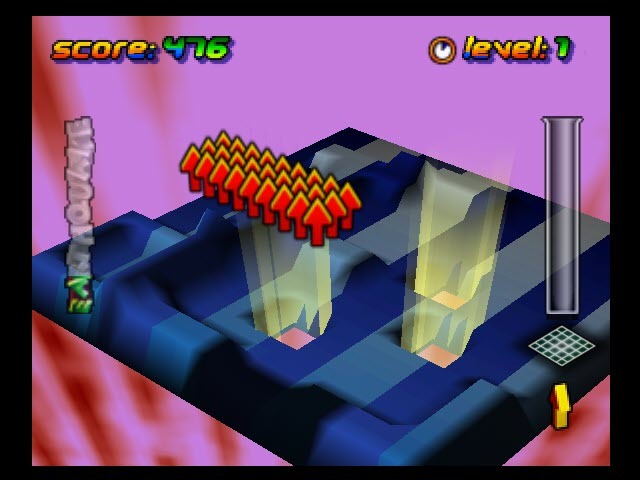 There’s a practice mode with the option to have a computer player demonstrate some of the basic concepts alongside you, with the eighth lesson being a “road test” of sorts where you have to score 25,000 points, and if you succeed, you’ll unlock a selection of new game boards, such as national flags and the Mona Lisa. There’s also Pro mode, which ratchets up the difficulty considerably by starting you off at level 5, a Handicap mode which gives you a number of unfortunate starting scenarios to work out of, like a drain meter that starts at half full, or a board riddled with holes, and Challenge mode, with options like five minute time limits or a preset order of pieces, which could be a cool feature for two players look to have a high score battle free from the randomness of the standard game. Presentation is pretty well-executed here. The board floats before a kind of psychedelic sky that changes colors as you go up in level, and yet manages to not be distracting. Fireballs burn as they drop, and turn lakes into rising steam, bombs spiral and create big fiery explosions, and the ice cubes make a fairly realistic effect of a frozen lake that shines in the sun. Sounds are the real highlight here, though. 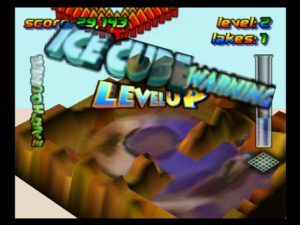 Important events like levelling up or creating a lake are narrated by a strangely robotic voice, rubber duckies quack, rainbows make a fluttery sound as they extend over the board, and the whole shebang is accompanied by a weird, trippy techno tune that could’ve come from a game like Tetrisphere. Amazingly enough, despite all the different simultaneous sounds, it manages not to pile up on top of each other and strikes a nice balance between serenity and frenzy. 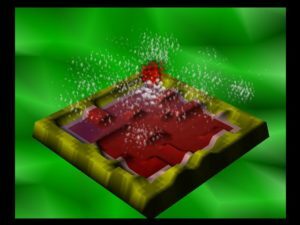 Overall, Wetrix isn’t a must-have game that your N64 collection would be truly incomplete without, but it is a well-done puzzle game with a pretty unique concept, that makes for a pretty good time-waster. To use one of my favorite analogies, Wetrix is a lot like a Fig Newton. It’s not going to get you entirely full, and it’s not an explosion of bold flavor, but it’s tasty and never disappoints. Unique concept, plenty of game modes, solid graphics and sound. Isometric view can lead to some depth perception problems with pieces, may not work properly on the emulator you don’t have. Never heard of this one, but it sounds great! I remember 3D terrain deformation would pop up from time to time through the years, but never seemed to catch on. I remember you could destroy land in Magic Carpet, but can’t remember if you can build. And Populous. Except Minecraft, not 3D though! Populous is a neat game btw. Peter Molyneux… Great game designer. You wanna know something sad? This obscure N64 puzzle game still did terrain deformation better than Red Faction. Wow, this is an innovative idea for a puzzler! And I can even through an 8-bit game into the “terrain deformation” mix: “Dig Dug 2” for the NES. When I first bought it, I couldn’t get it to load; then years later I got it working for a little bit, and I wasn’t as into NES at the time so I didn’t play it for very long, but it looks like you can kill enemies by either pumping them up, OR by jackhammer-ing away the portions of the island they’re on.